Accredited Buyer’s Representative – The Accredited Buyer’s Representative designation is designed for real estate buyer agents who focus on working directly with buyer-clients. Agents with the ABR designation have valuable real estate education that elevate their skills and knowledge for home buyers. They have ongoing specialized information, programs and updates that help them stay on top of the issues and trends in successfully representing home buyers. The agent also has access to exclusive resources to share with clients. The ABR designation is through REBAC (Real Estate Buyer’s Agent Council). At Home With Diversity – The At Home With Diversity course is part of a comprehensive cultural diversity outreach program that helps real estate companies diversify their workplaces and improve the industry’s ability to serve culturally diverse consumers. This program is a joint effort between HUD and the National Association of Realtors to certify real estate professionals who are trained regarding cultural diversity and outreach and have made a commitment to a set of diversity principles. The training, built on the letter and spirit of the Fair Housing Act, provides the agents with tools to build diversity outreach into their business plans to best serve a dynamic and growing market. This course is available through REBAC (Real Estate Buyer’s Agent Council). Broker Price Opinion Resource – The Broker Price Opinion Resource certification provides realtors with knowledge and skills to reduce risk and increase opportunities to create professional and accurate BPO’s. Evaluating properties depends more than ever on professional expertise and competence, the best use of technology, and a commitment to approach the valuation assignment from all pertinent perspectives. The BPOR certification allows agents to become knowledgeable in creating BPO’s, reducing risk, and applying alternative valuation techniques. BPO’s provide critical information for decisions, and have been widely adopted as a valuation tool in the mortgage industry, and increasingly, for government programs intended to aid the economy and help homeowners avoid foreclosure. The Broker Price Opinion Resource certification is through the National Association of Realtors. Certified International Property Specialist – The Certified International Property Specialist Designation provides the realtor with knowledge, research, networks and tools to work in the international market. International real estate opportunities are everywhere. New people move to the US from other countries every day and foreign-born individuals residing in the US move to new markets. Americans invest in property overseas. The CIPS designation gives the realtor the ability to work within these markets. This designation is through the National Association of Realtors. Certified Negotiation Expert – The Certified Negotiation Expert (CNE) is a course that is taught nationally by the Real Estate Negotiation Institute. It gives the broker the tools to be successful in bargaining and negotiating, persuasion principles, and classic approaches to get the best outcome for their client. The broker also has an understanding of the psychology of buying to better help serve their client. The certification also allows for the broker to have access to the negotiation planning guide and model. The tools and knowledge are used to get clients the best possible outcome! 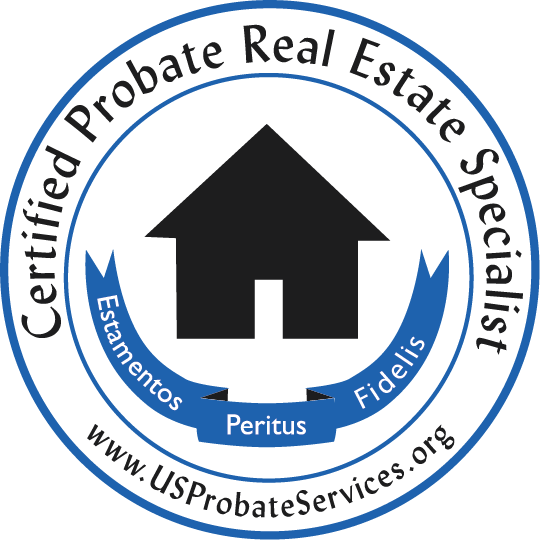 Certified Probate Real Estate Specialist – Many people have heard of the probate and estate settlement process, but wonder what it is and what the probate process entails. To put it simply, probate is the process the probate court uses to make sure the deceased person’s creditors are paid through estate settlement and that anything left goes to the deceased’s beneficiaries. Unfortunately, the probate and estate settlement process can be anything but simple, depending on the size and nature of the assets to be administered, the number of parties involved in the probate and estate settlement process, how well those parties get along, and many other factors. Complex probate and estate settlements are made all the worse by the fact that the family is in a state of mourning and under a great deal of stress. The last thing most families want to deal with at a time like this is the probate court system. US Probate Services was created to help people that find themselves in the probate process and don’t know where to turn. As a CPRES, the broker can help navigate the complex probate process. The certification is offered through MTI Education. Emerging Markets Homeownership Initiative – Emerging Markets Homeownership Initiative is a program of the Minnesota Homeownership Center and it is designed to increase homeownership opportunities for Minnesota’s emerging markets. The goal of this program is promoting homeownership in Minnesota’s emerging markets, and the Center supports the homeownership industry to service communities of color by offering reports and research about best practices, and training opportunities and other tools to address consumer barriers and make connections with other industry stakeholders and partners. The broker has completed these trainings and has the knowledge and tools to work with Minnesota’s emerging markets. Internet Marketing Professional Certification – The e-PRO certification allows real estate professionals to learn how to best use the latest online marketing and social media technologies, such as Facebook and Twitter, to create an online presence vital in reaching today’s hyper-connected consumers. This certification is earned through the National Association of REALTORS®. Housing Development Finance Professional – The Housing Development Finance Professional (HDFP) Certification gives the realtor knowledge about the development process, financial analysis techniques and structuring and negotiating skills that are needed to successfully develop and finance affordable home ownership and rental housing development. The realtor with this certification also has a good understanding deal structuring. The HDFP Certification is through the National Development Council. Military Relocation Professional – The Military Relocation Professional Certification focuses on educating real estate professionals in being better able to work with active duty military and veterans to find the housing solutions that best suit their needs and take full advantage of military benefits and support. This certification is through the National Association of Realtors. Resort & Second-Home Property Specialist – The Resort & Second-Home Property Specialist allows for realtors to better serve the growing second-home and resort real estate market. With this certification, the realtor will have knowledge and experience in facilitating the buying, selling, or management of properties for investment, development, retirement, or second homes in a resort, recreational or vacation destinations. A realtor with the training for this designation specializes in resort and second-homes and can assist with search for these types of properties. The RSPS certification is through the National Association of Realtors. Short Sales and Foreclosure Resource Certification – The Short Sales and Foreclosure Resource certification gives the realtor a framework for understanding how to direct distressed sellers to finance, tax, and legal professionals, qualify sellers for short sales, develop a short sale package, negotiate with lenders, tap into buyer demand, limit risk and protect buyers. This certification allows the realtor to have the knowledge and ability to work efficiently with short sales and foreclosures. The SFR certification is through the National Association of Realtors. Seniors Real Estate Specialist – The SRES designation, offered by the Seniors Real Estate Specialist Council, provides realtors with the knowledge and tools to understand and cater to the special needs of maturing Americans when selling, buying, relocating, or refinancing residential or investment properties. By earning the SRES designation, realtors are prepared to approach mature clients with the best options and information for them to make life-changing decisions.